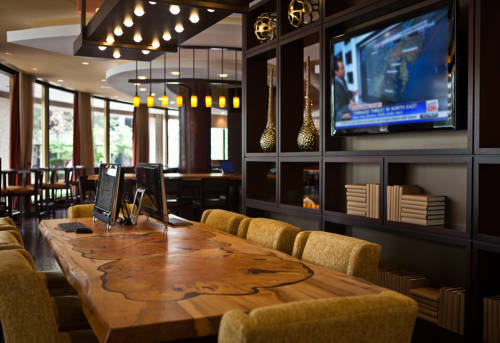 Enjoy style and substance at Crystal City Marriott at Reagan National Airport. Our hotel is conveniently located in Arlington, VA - near the attractions of downtown Washington, as well as shopping at Pentagon City. We're also a short walk from the Crystal City Metro station. Our well-appointed rooms and suites are ready to meet the needs of todays travelers, with wired and wireless Internet, Marriott's Plug-In technology panels, and evening turndown service. Soundproof windows and deluxe bedding in every hotel room ensure a peaceful night's sleep here in Arlington. Hosting an event in Northern Virginia? Our hotel features almost 10,000 square feet of meeting space, including the delightful Potomac Ballroom, which can accommodate up to 400 guests. Last but not least, our knowledgeable and intuitive staff is on hand to assist you with anything you might need during your Arlington, VA visit. Book your stay at the Crystal City Marriott at Reagan National Airport, and enjoy an innovative blend of work and play. BELL20 Tavern, the latest addition to the area s vibrant dining scene, introduces an innovative twist on American classics. Enjoy one of the top new bars in Crystal City, which features a variety of local microbrew beers during your stay with us. From made-to-order omelets and breakfast buffet to chopped salads, this Crystal City restaurant is the ideal place to enjoy your next great meal. Make sure to try the famous BELL20 Burger with caramelized onions, smoked bacon and a sunny-side-up egg. It's 19 feet tall, standing on a street corner since 1958.